We cannot recommend this book too highly. It has helped many men to understand and heal – while they are still behind bars – from the effects of childhood experiences that started them on the paths that ultimately landed them in prison. If you are interested in borrowing this book or film from 1in6, a free service we provide to our visitors in our efforts to support men as well as friends and family in their journey, then please use the form below. We encourage therapists and other professionals to purchase the offered resources in order to maximize our capacity to lend them to end-users free of charge. Once your request is received by our staff, we will mail the book to the address provided. NOTE: We are currently only able to mail items within the US. Books may take up to three weeks for delivery. This classic and remarkable book, often called the ‘convict’s bible,’ has helped many men (now in five languages). 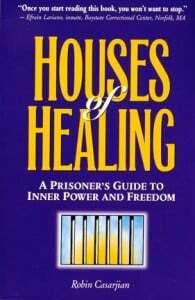 It offers simple and deep spiritual wisdom and detailed instructions for using spiritual practices (from a variety of religions) to find healing and freedom behind bars. Includes a section of inspiring letters sent to the author by prisoners, about their transformative experiences of putting the wisdom and practices to use in their lives.